The fifth most popular Deadspinoff on the net! Welcome to DeadOn, the illegitimate love child of Deadspin and Gawker*. 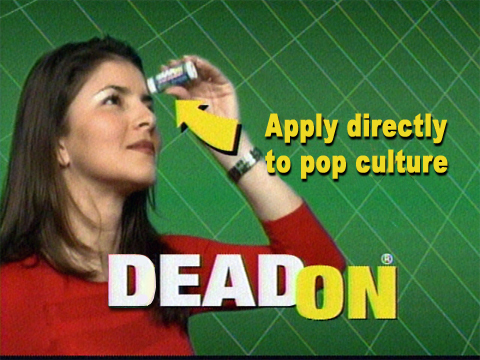 DeadOn features 22 23 nearly 30 of the funniest Deadspin PMers and their take on pop culture. *DeadOn has no affiliation with Gawker and little if any with Deadspin, the comments herein are solely those of the writers bloggers and in no way reflect the views of Deadspin, Gawker, or the Gawker Media empire in general. Awesome. We have strike-thru authority, here.